I heard the noise. What was supposed to be a mower attacking blades of grass had a distinctly different sound. Shortly after, the door opened and in walked our youngest son, Caleb. New to mowing, he was sprouting his summertime, blade-cutting wings. “Ummm, Mom?” he sheepishly asked. “You might want to come look at this,” he responsed. Realizing something was off the mower’s normal-beaten path, I listened as he explained how he hit the new guttering. The expensive project was installed only weeks before. Keep calm, Kristi. Remember, your words will cut or give life. It’s only guttering. He’s more important. An elbow lay, beaten and slightly torn, ten feet from the point of impact. The screws were ripped clean out of the long downspout, but a quick pop and they were back in place…somewhat. The curved piece stood as tall as possible considering its roughed-up, trying-to-be-toughened-up condition from the mower’s unexpected attack. Regardless, the downspout elbow was salvaged. Darling son continued to mow, and our relationship was good. That wasn’t always the case. I have a tongue that can cut through a little kid’s skin, straight to the depths of a tender heart. Adults too. Maybe you understand? Have you ever had trouble with your words, winding up and tossing out the wrong ones, speaking and whizzing them at another with the speed of a fast pitch baseball? It’s easy to react, isn’t it? Remember “they” are our neighbor. They’re important. Amid the guttering situation I found an internal cheerleader reminding me to treat Caleb the way I would want to be treated. Believe me, my flesh argued. Whether it’s a child, spouse, friend, or foe, our “co-star” in the situation has been made by the same Creator that formed and fashioned us. Our Lord calls us to love them as ourself. Being bathed with anger, poked with sharp responses, or slathered with chilly silence doesn’t speak love. Remembering this before we respond is key. Battle well, my friend. God has your back. We all hiccup, sin, and make poor choices from time to time, but then Jesus comes along with grace. Good ‘ol, life-saving grace, where would we be without it? Where would we be without Jesus? His grace is beautifully sufficient for us, amid our insufficiency. It is sufficient for “them” too. It’s much easier to freely give space and grace when we recall we’re all members of the “falling short/God of grace” club. The bended knee of humility will take you far. He’s faithful. It boils down to a choice. Yes, each “guttering” response offers opportunity, a choice to serve the Lord God Almighty. We may not like what’s been thrown at us, and it may not even be fair, but it’s there. The choice on how to proceed, with emotions or with faith, is yours. Whom will you serve? Proceed well, my friend. God awaits, and it’s good. 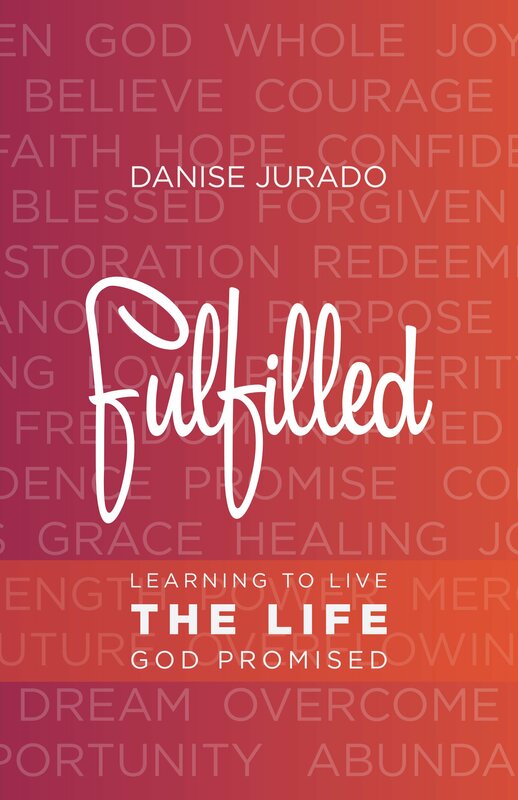 The winner, after the re-draw, of Danise Jurado’s Fulfilled: Learning to Live the Life God Promised, is Susan Mead. Yay for Susan! 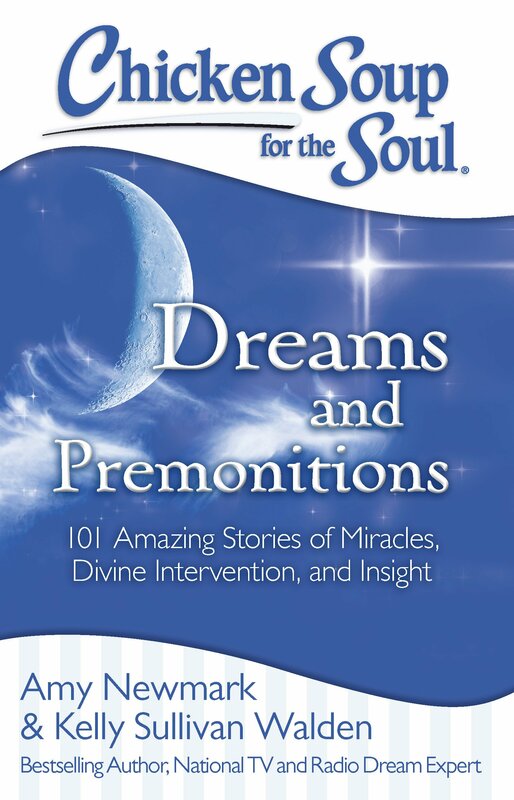 Today is release day for Chicken Soup for the Soul: Dreams and Premonitions. It’s loaded with entertaining and encouraging stories. If you peek at page 333, you’ll see my story Tested, Not Arrested. (Can you tell I’m excited?! Thank You, Lord.) It’s available to buy here. Would love to have you join me as we link here: Intentionally Pursuing, Purposeful Faith, Holly Barrett, Jennifer Dukes Lee, Holley Gerth, and Suzie Eller. It’s really hard to keep your calm when things really really go crazy and when someone piss you. But I agree. It’s a choice. No one can make you angry unless you let them (forgot who said that). And in the end, our reaction defines us and not the situation or the other person. It is hard, Lux. I love it that nothing, however, is impossible with God. Enjoy the day! 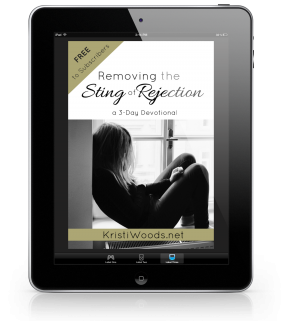 “It boils down to a choice.” Yes, Kristi! 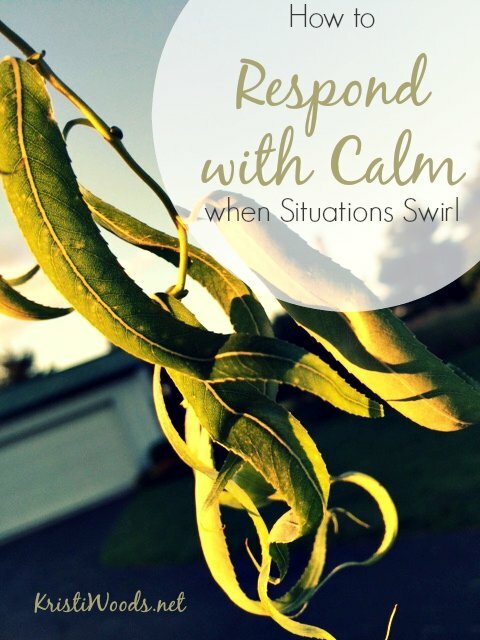 And as I am so often the “swirl” and not the “calm,” it is clearly a choice I need to make more wisely, more often. Thanks for the challenge today at the #‎RaRalinkup‬! Yes, yes. Every response, every reaction gives us that invitation to make a choice. And only by His grace can we do it in a way that honors Christ, that encourages others, that makes His light shine. Only by His grace…oh yes. You’re a blessing, Linda. Thanks for stopping by. Sounds like you were really led by the spirit in that situation Kristi! I must say that I have always been pretty adept at injuring people with my tongue. I ask God daily to help me with that . I’ve noticed I am at peace more often with fewer arguments and hurt feelings for sure. I am still a work in progress but I am thankful that God is working through me. So glad I found your link via intentional Tuesday. My mother is getting the urge to write and she asked me to send her some links. I think she will be encouraged reading your thoughts too. Many blessings to your and yours. Have a wonderful week! We’re all works in progress, Horace. 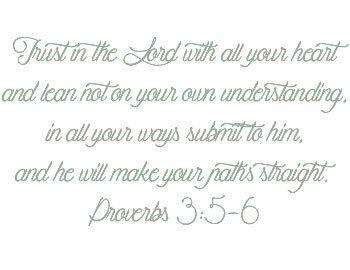 Thank God that He is patient and faithful. And thanks for sharing the link with your mom. Wow, congratulations — holding your tongue through that one was certainly evidence of God at work in your life. Thanks for the motivation to think and then speak, to demonstrate the fruit of the Spirit in my home! Evidence for certain. 😉 Thanks for stopping in, Michele. You are a blessing. I’m with you, Betsy. Maybe we should design wallpaper with “stop and remember” on it! Congrats on your publication release. I am happy for you. It may not be easy responding calmly in the midst of very troubling situations. Thank you for drawing attention to the words we say. They are very important. I am intentionally learning to keep calm by His Grace. Gosh, every single day do I have to remind myself that my young ones are tender. Every day do I pray to receive God’s perspective…that they are learning and growing, not adults with full understanding and discipline. Even if they were grown, we all fall. Thanks for providing scriptures. I like to keep them on the tip of my tongue too. My family life is much better when I do;) Have a great week, Kristi! We all do fall, and isn’t it beautiful when another stoops to help us up vs. tossing a few kicks. I’m with you, Meg. So glad His provision and faithfulness are seeing you through the hit. Thanks, Bethany. 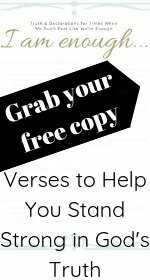 Your words are a welcome salve to someone who has beaten herself up about words in the heat of the moment… God has grace sufficient for those past flubs, and is waiting for me to ask Him to fuel me with better words for future! Just, awesome. Always love visiting your blog, girl! Much love…. Yep, I can always use a reminder of this lesson, Kristi. Guarding our reactions is a life-long challenge — at least it is for me! 🙂 And congrats on your story in the Chicken Soup book! Very exciting! I’m with you, Cheryl. Life long….. 🙂 Thanks for your congrats. We’ll have to celebrate both your’s and my milestone at writer’s group. We all need to be reminded of this, Kristi. Thanks so much for being you and for showing up on #livefreeThursday. Thank you, Kristi, for the reminder about how we would feel if we treated ourselves in the same way we harshly treat others. Kristi, this is a wonderful reminder of the power of words, both positive and negative. Yours were powerfully positive!